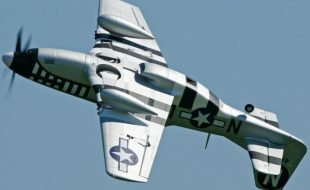 When it comes to sheeting the wings, you want to do it right with any airplane, but for giant scale warbirds, you really need to do it correctly. I like to start once the retracts are setup and the plywood support ribs and the mount rails have been epoxied into place. 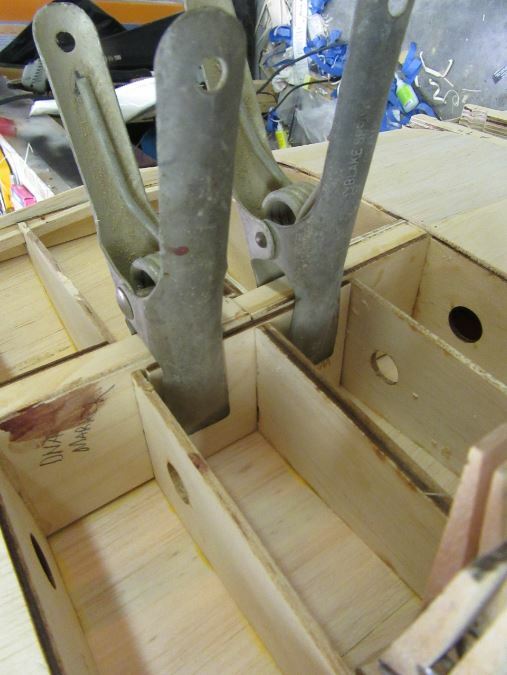 We used the landing gear itself as a spacer for the rails and plywood ribs, so we know they will fit perfectly into place after the wing panels have been sheeted. I even added an extra 1/8 inch of space so there’s a little wiggle room in case we need to tweak the gear’s position for proper toe in measured at the axles. 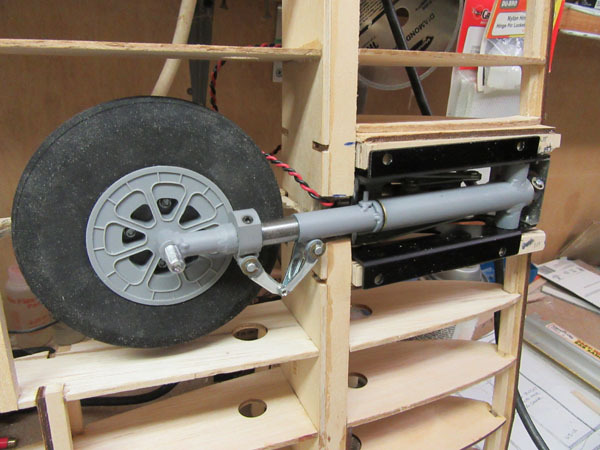 After getting the support ribs and rails in place, I added a lite ply support doubler to the W-6R rib which has it mid-section cut away to clear the wheel and forms the wheel-well area. Also at this point it is a good time to go over the entire wing structure and sand everything smooth and flush. 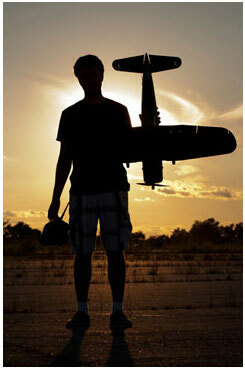 To get started, look at your plans and estimate how much sheeting you will need to cover your wing panels. For this project I am using medium-grain 3/32-inch x 4-inch wide x 48-inch long sheeting. You should have a good supply of no. 11 X-Acto blades. I start by first truing the edges of my sheeting by cutting a small amount, (1/16- to 1/8-inch), from the side edges using a sharp blade and a long metal straight edge. 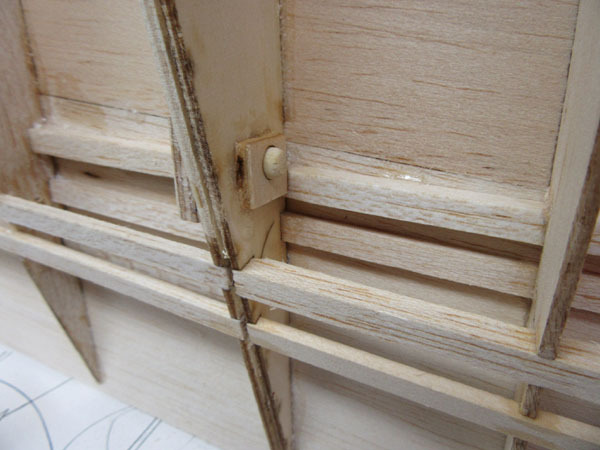 This allows the seams between the sheeting to be tight and minimizes the gaps. 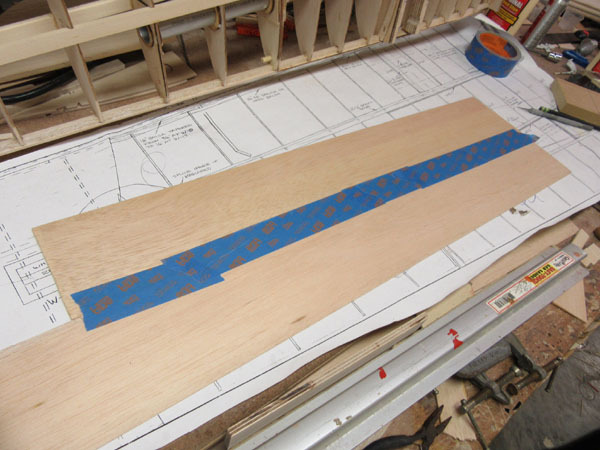 I start with the bottom, aft sheet which forms the wing’s trailing edge. I cut it to length, pin it over the plans and then pin the wing structure over it. 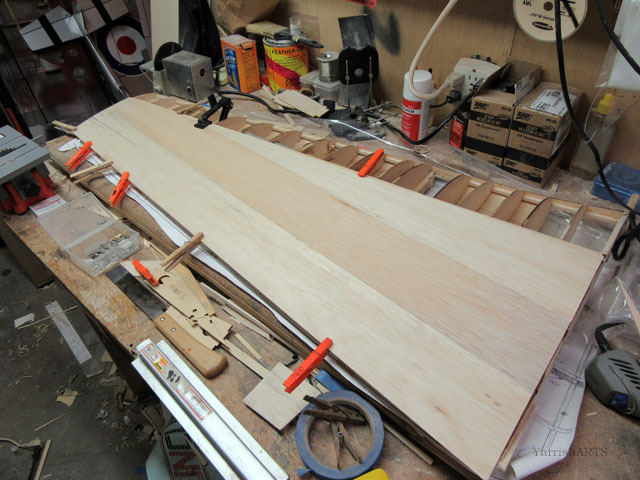 I then tack glue a couple of ribs along the length of the wing panel to the sheeting. 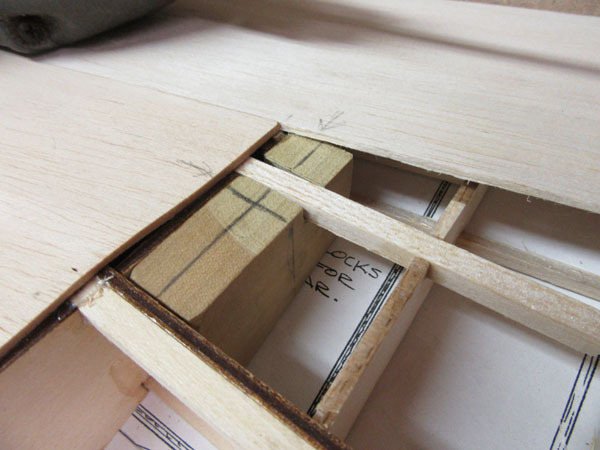 This is the easiest piece to apply as you have full access to the wing structure. Once this is in place, I add the next piece of sheeting that is cut to cover the area from the Trailing edge piece to the main spar. 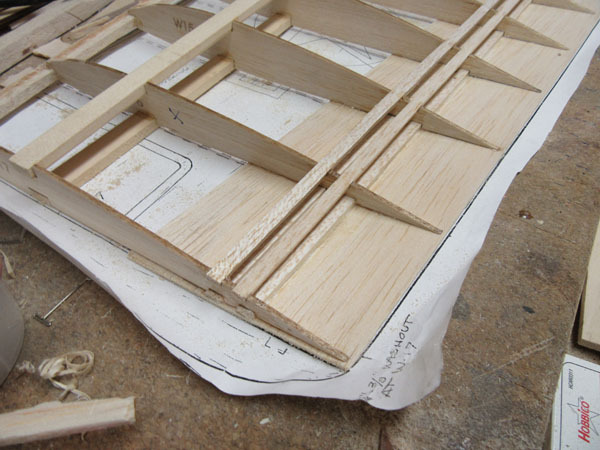 You can start anywhere, but I like to begin at the tip rib, applying Zap medium glue to the rib and sheeting, hitting with a little Kicker, then moving inboard one rib at a time. 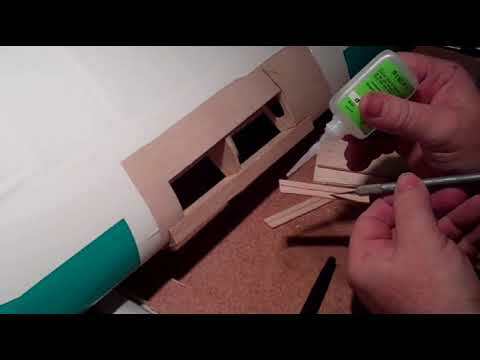 The important thing here is to not force anything while gluing the structure to the sheeting so you don’t warp the wing. 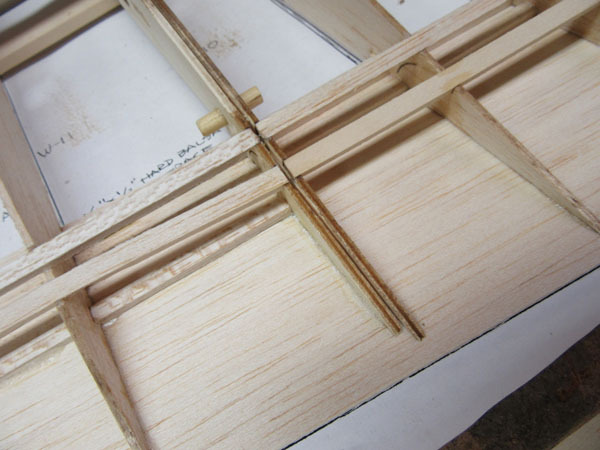 The washout was built into the wing when it is assembled over the plans and supported with alignment shims. We will recheck the washout again before applying the wing’s top sheeting. Here you see the next piece of bottom sheeting. 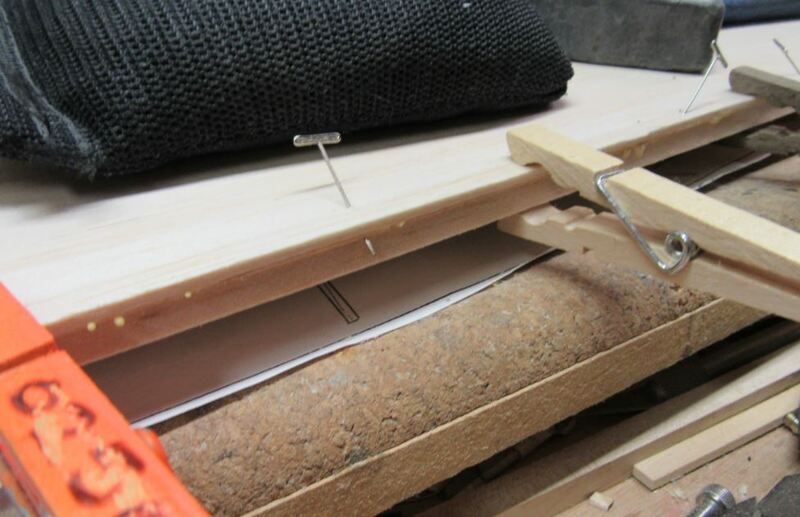 It is made by gluing two sheets together as mentioned above to cover the area from the front edge of trailing edge sheeting to the center of the main spar. Start by taping the pieces together with painter’s tape as shown above. Flip the sheeting over, and prop the seam up so it opens like a book, apply some yellow glue like Titebond, and scrap away any access. Weigh the sheeting down and let the glue dry. If there is still access glue at the joint, use a damp sponge to clean it away. 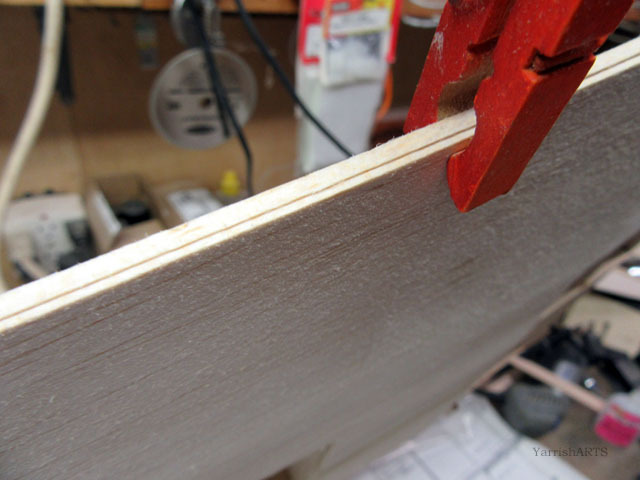 Once the glue has dried, lightly sand the joint with a sanding bar then cut the piece of sheeting to size. Here the sheeting has been taped to the trailing edge sheeting piece and the front edge is glued and clamped to the main spar. 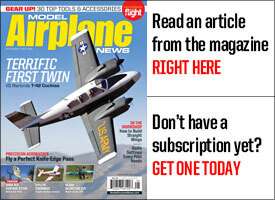 Again, there should be no stress or pressure causing the wing to twist out of shape. 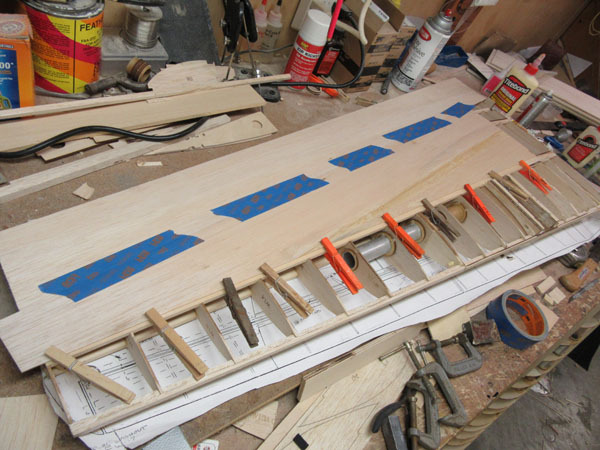 With the center piece of sheeting taped and clamped into place, flip the wing panel over and start gluing it to the ribs and stringers. I use Titebond at the main spar, and Zap medium CA for the rest of the rib bottoms applied from above. 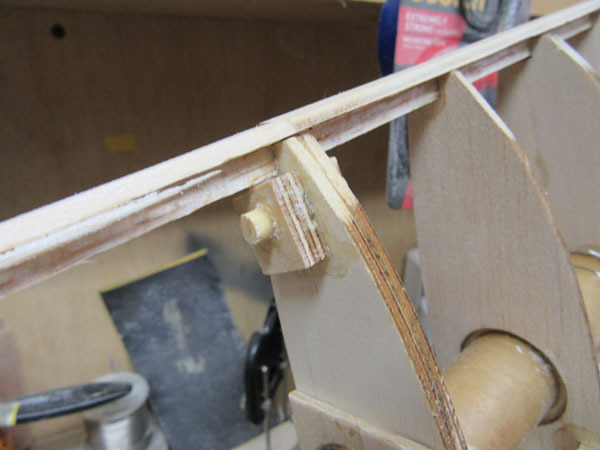 At this point I added the alignment dowels to the ribs that form the separation line for the outer wing panels that will plug into the wing center section. 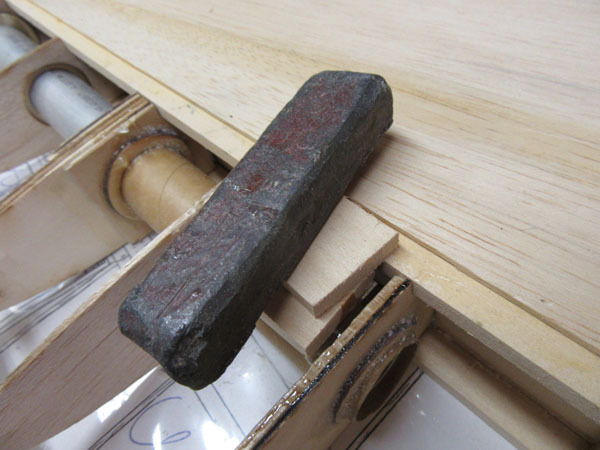 Here the fixed end of the front dowel is secured with a square of 1/4-inch plywood. 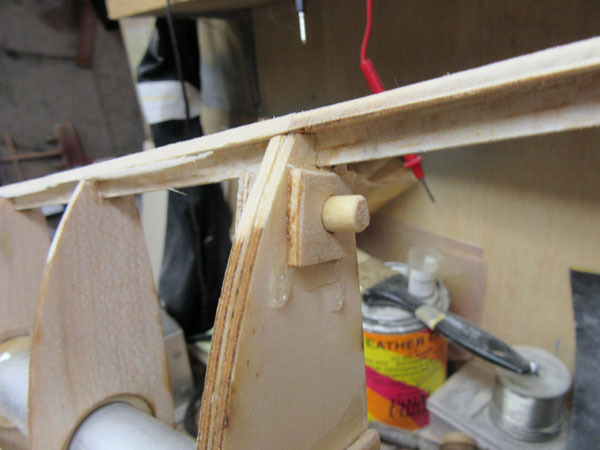 The receiver end of the dowel is supported with a square of 1/8 inch lite plywood glued to the rib, but not the dowel. 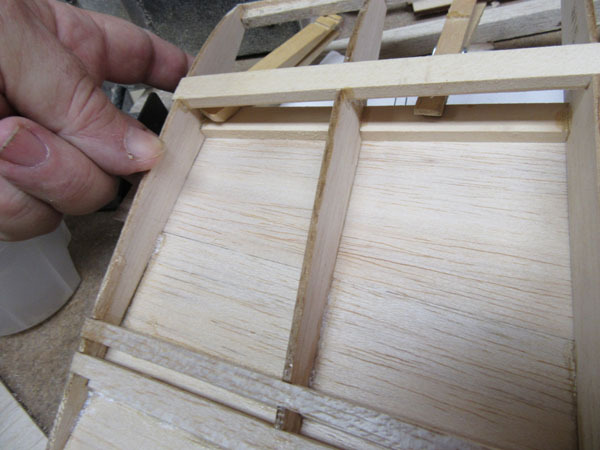 Above you see the same treatment for the aft wing panel alignment dowel. 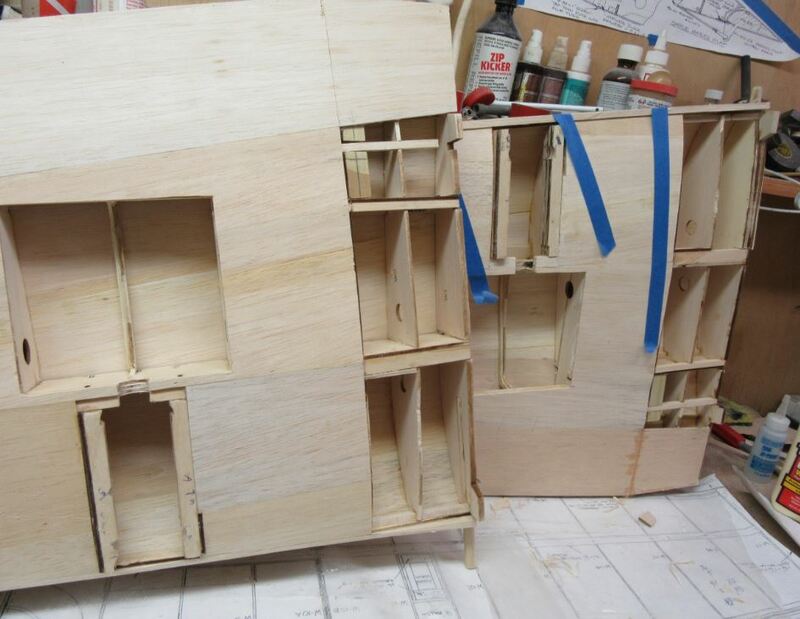 Here you see the two W-10 plywood ribs forming the separation line between them. 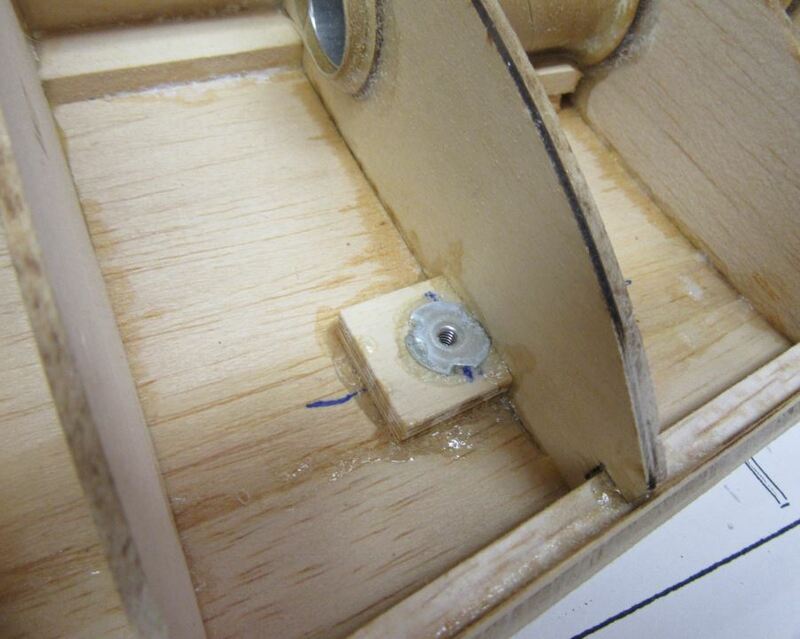 Other internal parts that need to be glued in place are the wing hold-down screw support block shown above. I made it from 3/4 inch thick poplar, cutting, and sanding it to shape so it fits flush between the upper and lower sheeting. Also before we can cover the front section of the wing panel forward of the main spar, we have to epoxy the outer wing panel attachment bolt support blocks in place between the wing tube socket tube and the bottom wing sheeting. 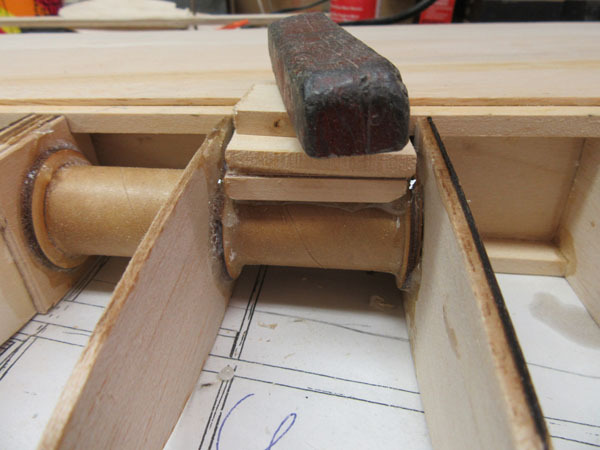 To keep the blocking flush with the main spar, I used an alignment piece weighted down with a piece of lead. 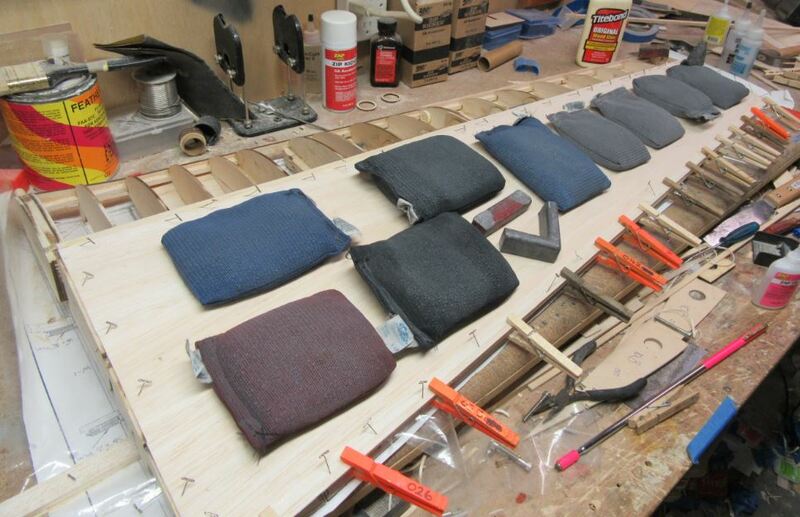 This ensures that the pieces are securely epoxied together and that the sheeting will fit flush over the blocking. After the wing has been completely sheeted, I will drill a hole through the sheeting and blocking, into the aluminum wing tube. This will then be threaded to accept the attachment bolt. 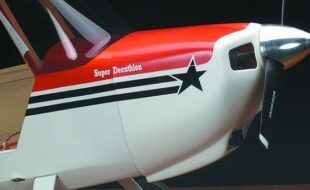 The lower leading edge sheeting is applied in the same way as before. Cut the sheeting to length and shape and tape the pieces together, Here the short sections inboard of the landing gear area is shown. Apply yellow glue to the top of the spar and the ribs and then tape and pin the sheeting into place. 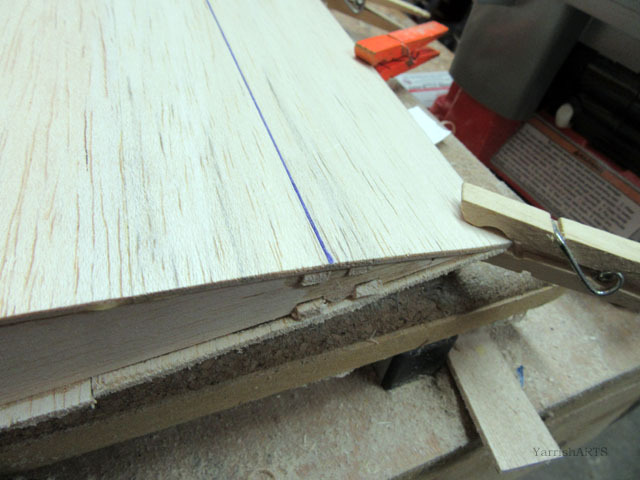 I also tape the leading edge tightly over the sub-leading edge strip and use some clamps to form a tight seam. Now let dry. 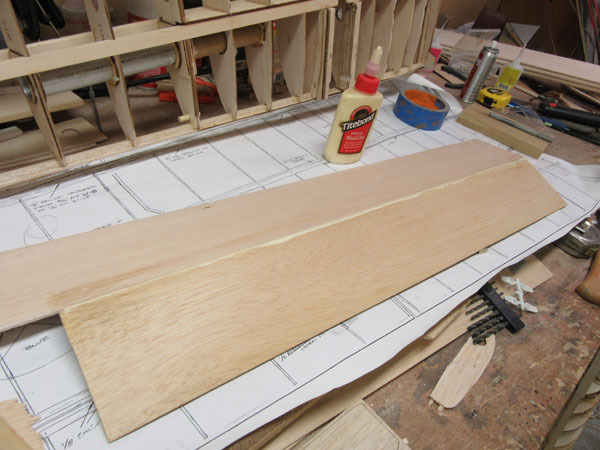 (Above) So, again the sheeting for the lower leading edge forward of the main spar, outboard of the landing gear rails, has been cut to size, glued together, weighted down to dry and then sanded smooth . Here all of the bottom sheeting has been installed on the left wing panel. 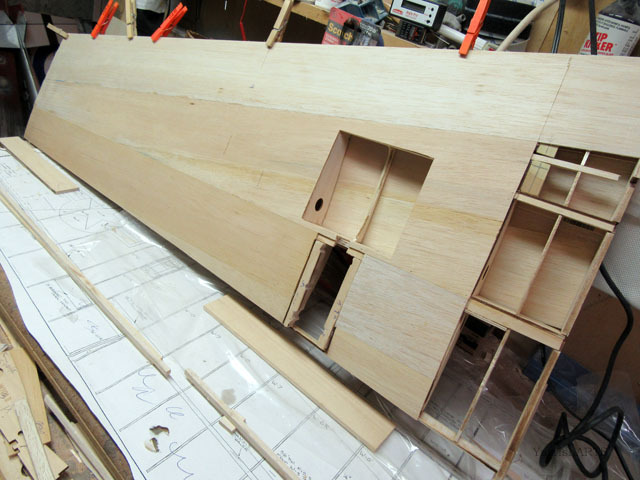 The area near the root ribs is left unsheeted so the two panels can later be epoxied together and the two plywood dihedral joiners inserted and glued on place. Before gluing the top sheeting in place, install all the other items like hard-points for the drop tank pylons, and so forth. Once the top sheeting is in place, you won’t be able to get to them. So now we do the same for the wing’s top sheeting. Glue and tape the pieces together, sand smooth, cut to size and glue the section of sheeting in place with Titebone yellow glue. 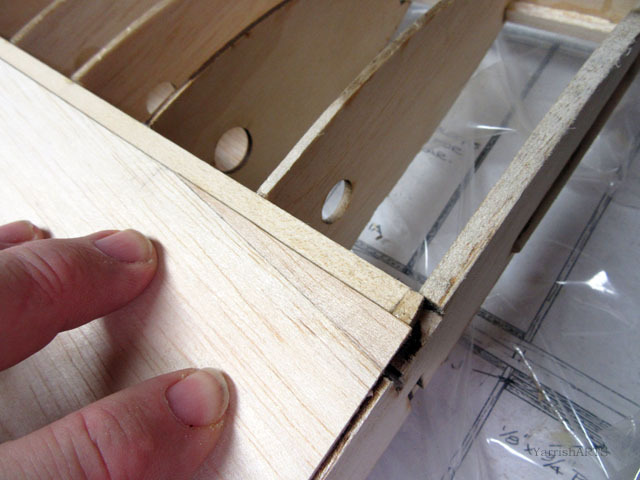 Apply the glue to the top of all the ribs and the spar but be careful not to get any glue in the separation line between the two W-10 ribs. 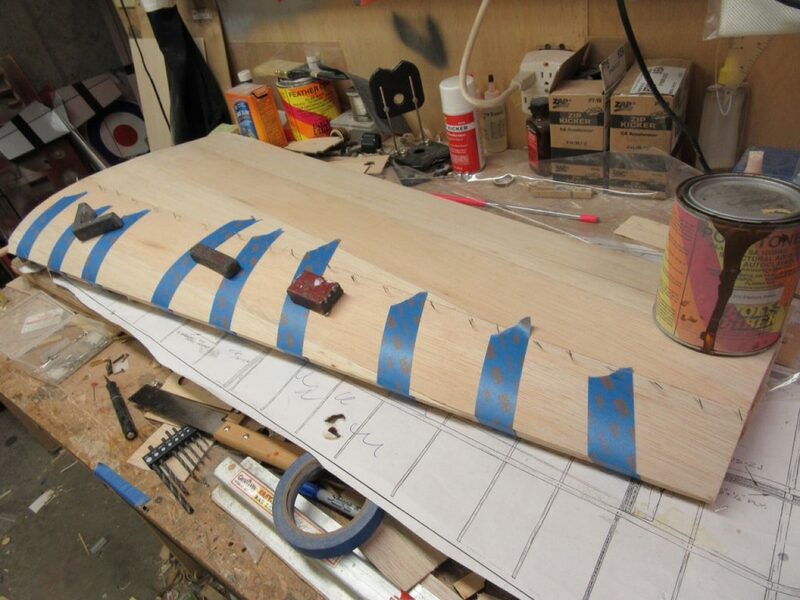 I added just a small amount to the every edges of these ribs as more glue can be added when the inner and outer wing panels are cut apart and separated. Here you see the aft sheeting is cut to end at the centerline of the main spar. The sheeting is cut so the grain runs parallel to the trailing edge. These cuts in the bottom sheeting are guides for the cut line between the main wing and the removable wing tip sections. They were cut through before the top sheeting was applied. 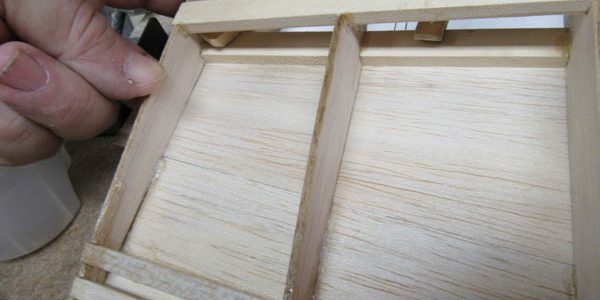 Also before the top sheeting is glued in place, the trailing edge of the bottom sheeting must be sanded to bevel the edge so it is flush with the wing ribs. The provides a good purchase for the top sheeting to glued to. 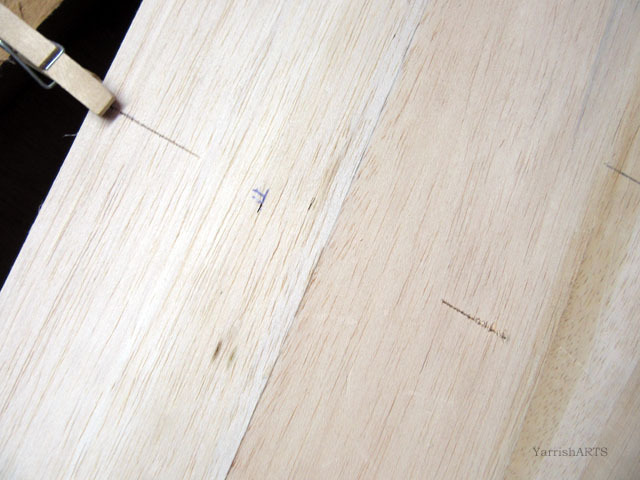 To keep the trailing edges straight while the glue dries, I add a straight piece of wood under it and clamp and pin the trailing edge to it. be careful not to glue this support piece in place. Wipe away any glue that oozes out. 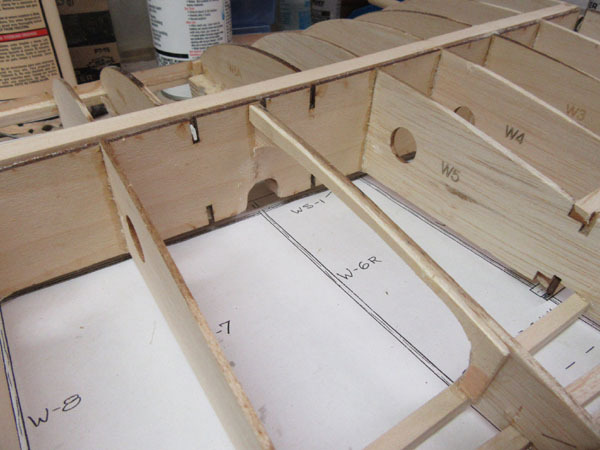 Also before the top sheeting is glued in place, I marked the cut lines with a pen for the ailerons and the flaps. 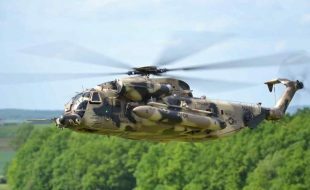 This makes the task of removing the control surfaces much easier and cleaner. Also before installing the front top sheeting to the wing, add any pieces that will be covered up. Here you see the vertical sheer webbing being glued into place. 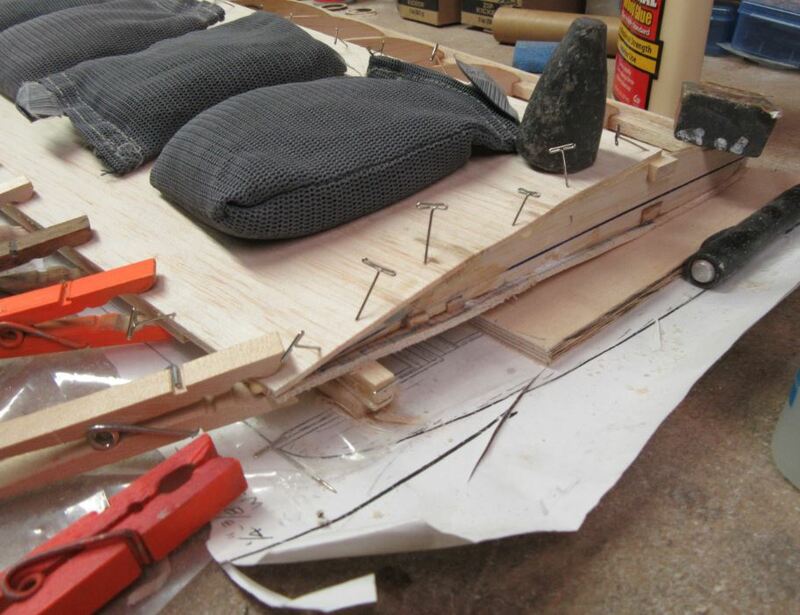 Here the right wing is shown with the sheeting weighed down with Scuba diving shot bag weights. As the top sheeting is applied the wing structure must be placed back onto the washout alignment shims so the wing retains its proper shape. Here you see the tip end of the wing. 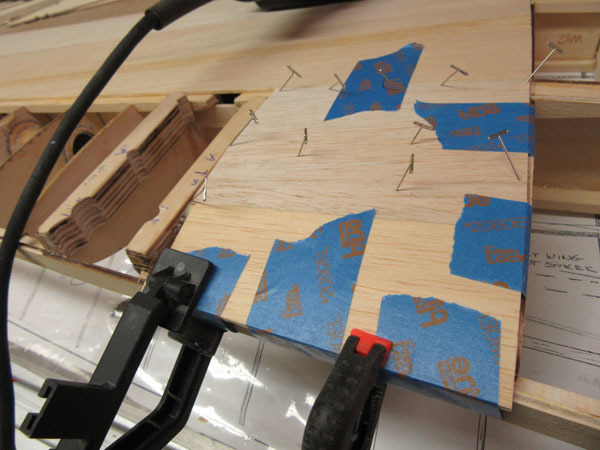 It shows the shim strips as well as 1/4 inch thick shims added to raise the panel above the workbench. When we added the landing gear mount rails they protrude below the surface of the wing so the additional shims are required so they clear the work surface. The shims run along the main spar as well as the under the washout shim strips. Once the sheeting has dried, you again prepare the sheeting for the top section forward of the main spar. 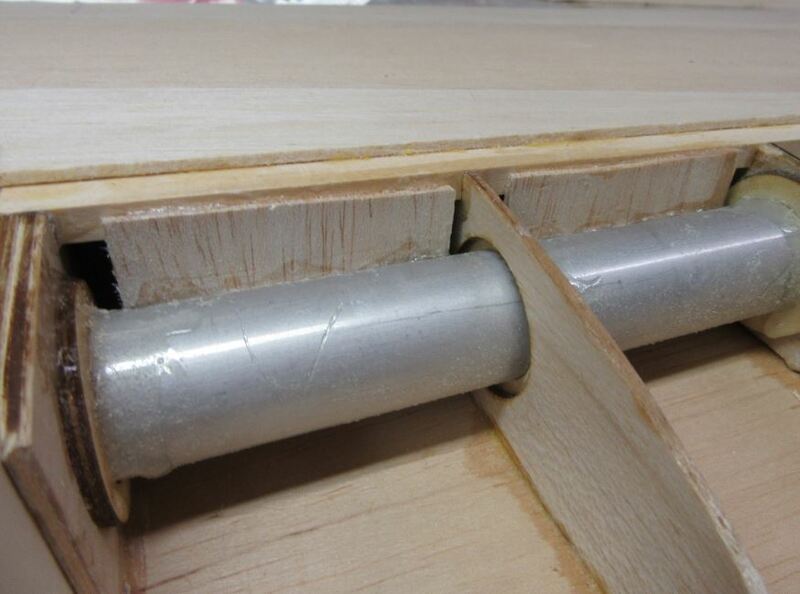 Here above, you see it pinned to the main spar and taped down onto the sub-leading edge strips. 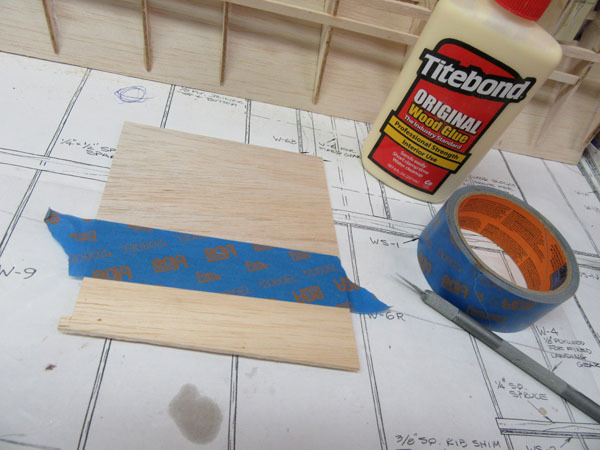 Once the glue has dried, your will sand the front of the wing panel smooth and straight and add the 1/4 inch leading edge material and then plane and sand it smooth to complete the wing. 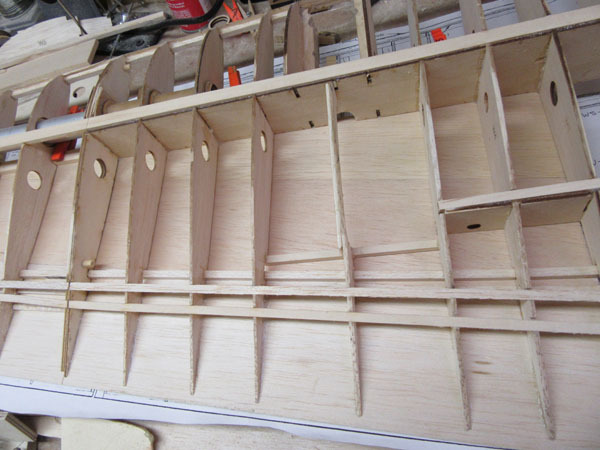 Here’s the completed left wing panel with the shaped leading edge in place. 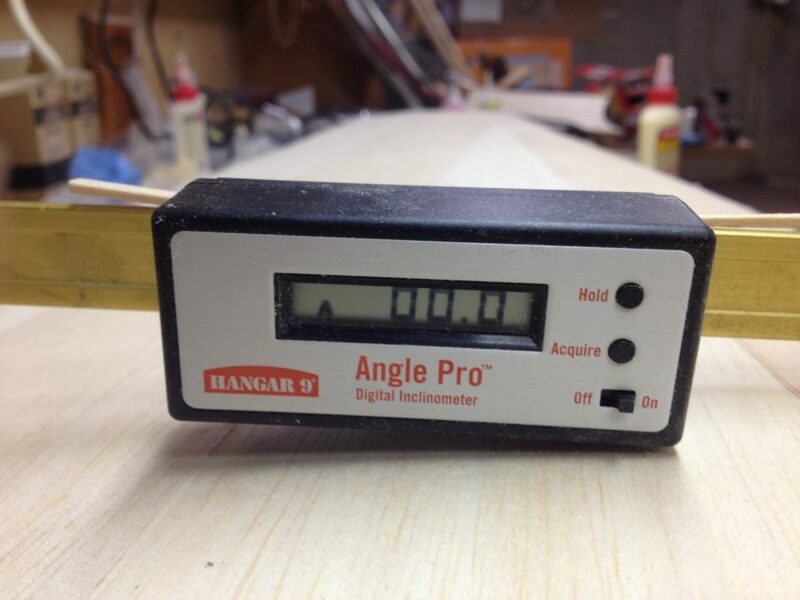 I have installed the Hangar 9 Angle Pro digital level to check the washout of the wing panel. With the panel blocked up so it won’t move, I zeroed out the reading at the root rib. 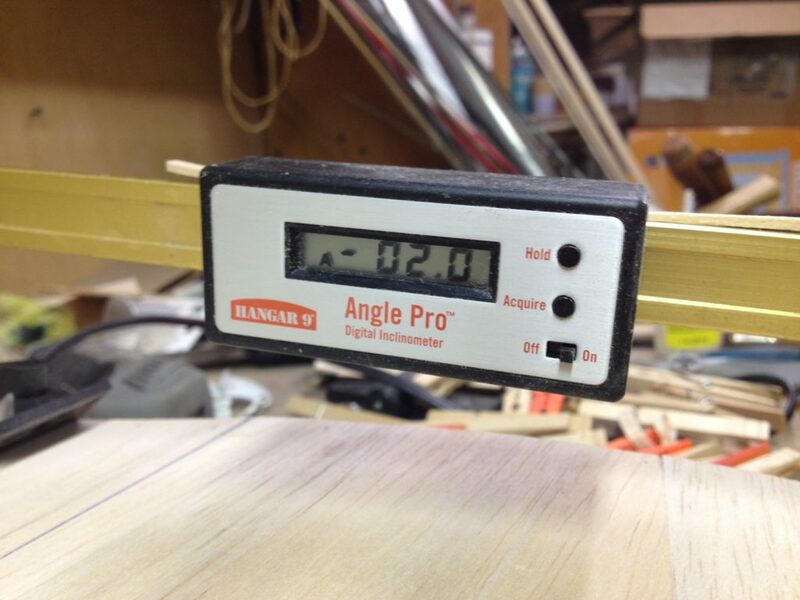 I then moved the level to the wingtip and checked the reading. The plans call for -2 degrees of washout and this shows it is spot on. The trick however is to have your other wing panel come out with the same amount. So here we are, both wing panels have been sheeted and and the root section as shown above has been left open on the bottom. 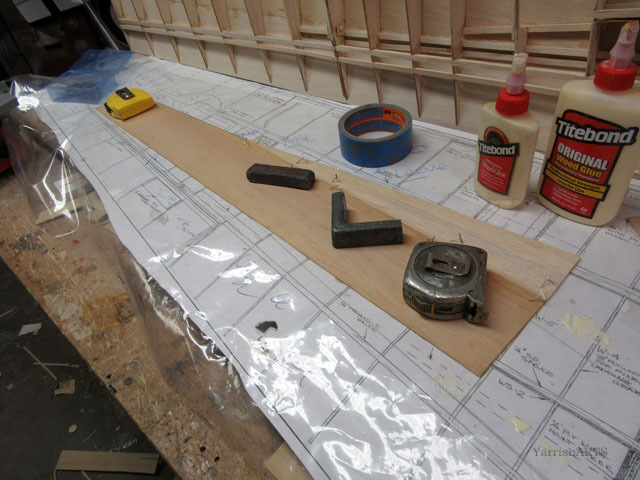 This will allow us to glue the wing panels together and then inset and epoxy the plywood dihedral braces in place to strengthen the wing structure. 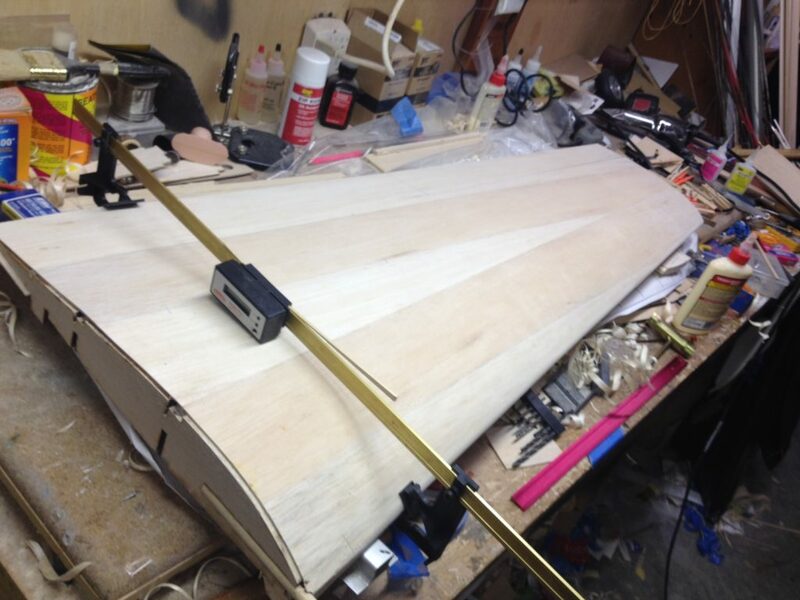 Here the plywood dihedral braces are being epoxied into place. Slow setting epoxy is being used so there is time to make sure the alignment of the two wing panels is correct before the adhesive cures. 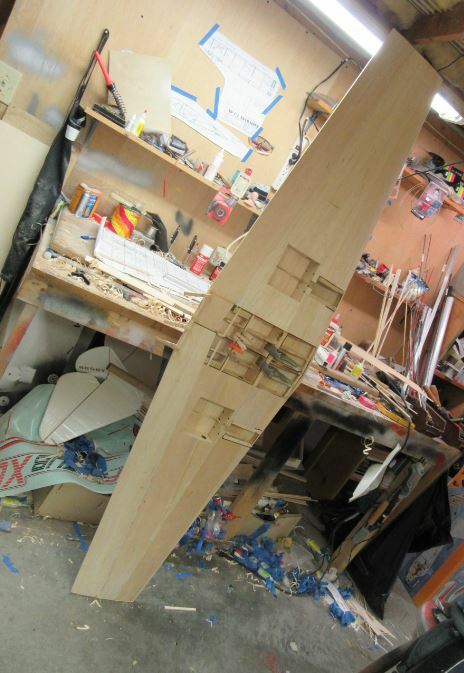 The wing panels have been glued together and the wing is now ready to be installed on the fuselage. 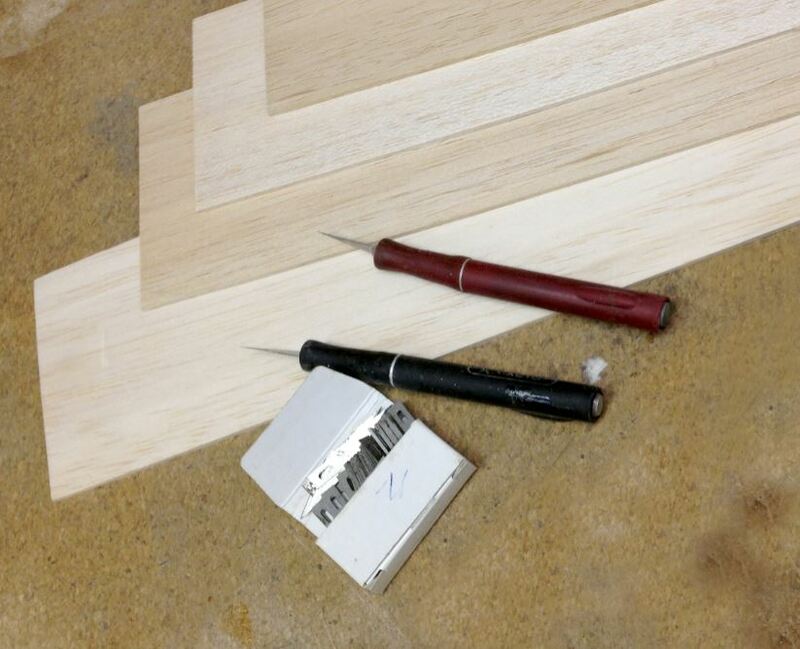 I have found the easiest way to get a true trailing edge where top and bottom sheeting join (i.e. 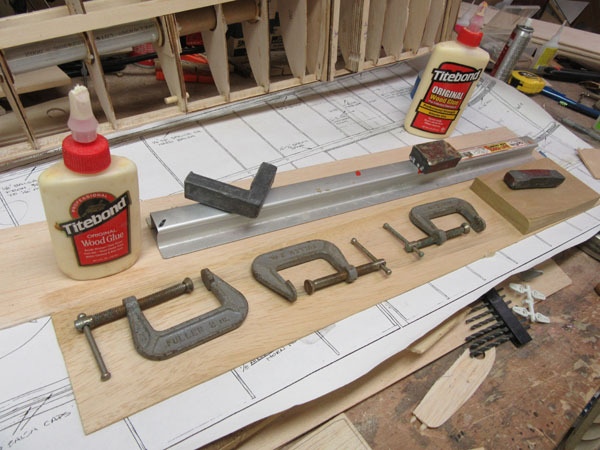 no trailing edge stock) is to clamp aluminium angle stock, about 1″ x 1″ x length of wing, top and bottom of the TE sheeting when gluing. This ensures absolutely straight trailing edges without ripples which can arise if the sheeting is only clamped at intervals. I know this technique was developed for a certain airplane. 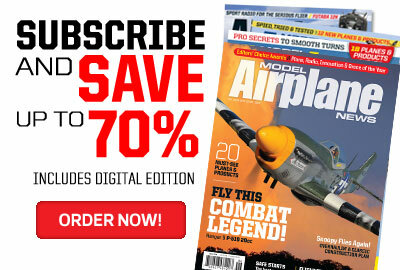 I’m learning how to build my own airplane (with lots of help from a mentor), a Great Planes PT-40. 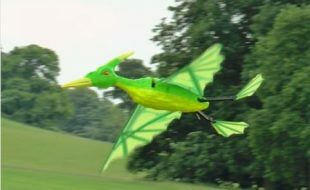 It has front sheeting both on top and bottom, and full sheeting for the wing tips and the middle of the wing where the servo goes and where the wings are joined together. The guy I’m learning from has a different way to get the top sheeting to curve. What he showed me was to take a paper towel and put some water on it, and lightly rub the towel and water over the top of the sheeting where you want it to bend. 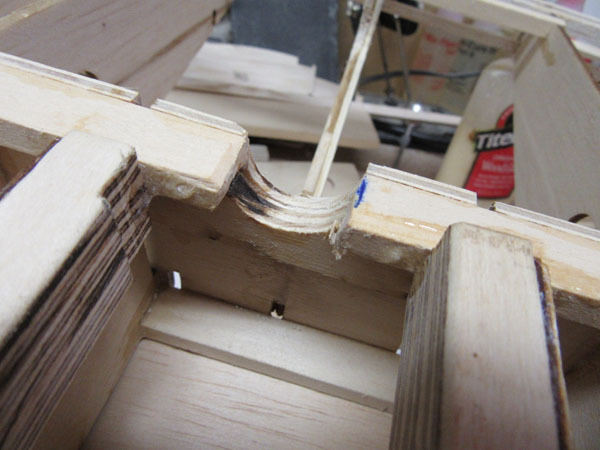 That will cause the wood to curve, and then you can glue and pin it in place. Again, I don’t know if it would work with this plane since the sheeting appears to be thicker, but it’s meant to be food for thought. And an alternative suggestion. 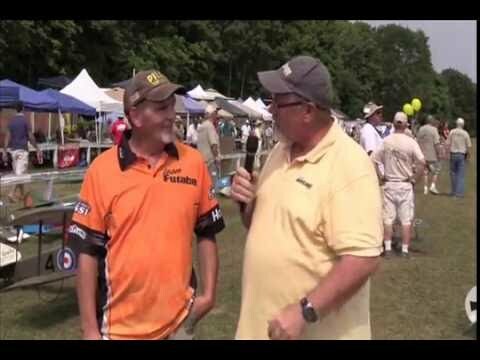 Hi Michael, the shot bags I use are available from the local Scuba diving supply shop. The do cost more than $5 a piece however. They are known as soft weights and are placed in velcro pockets in a scuba diving belt. Available at all Scuba shops. Michael. If you have the lead shot already, try using Zip-lock sandwich bags. I have done this with sand to make soft weights also. Works great. Good Job of explaining sheeting. I do it almost the same. On the trailing edge I do it the same except I glue a 1/4 ” strip of BVM carbon fiber to the beveled trailing edge before glueing the 2 trailing edges together. This makes the trailing edge straight and tuff. Where are you going to get the cowl to fit this smaller Zilroli kit? Hi Marshal, thanks for commenting. 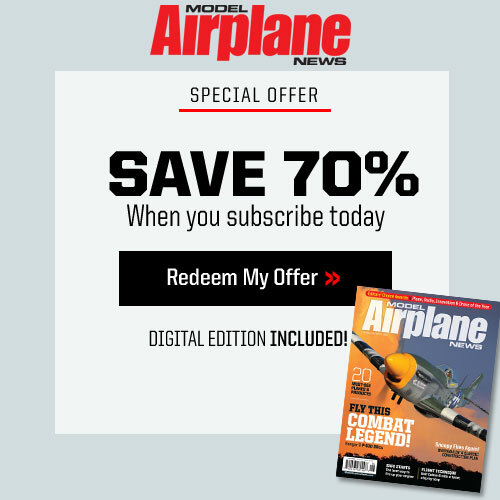 For the reduced size 85 inch span Skyraider, I plan to scratch build a wood cowling to fit the fuselage and then send it to a friend who is a mold maker by trade. He is going to make a couple of fiberglass cowls for me in exchange for some other RC goodies I have in the shop. Also, the clear bubble canopy looks like a 13 inch WW2 canopy from Sig Mfg. will fit nicely. If it does not work out, I will make a wood plug and have a canopy vacuum-formed commercially. Nice build. The shot bags look like a good idea. 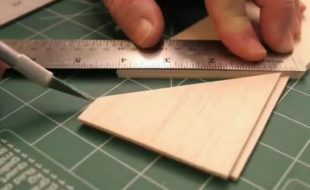 I build mostly smaller airplanes and sailplanes, so I’m usually sheeting with 1/16, 1/20 or 1/32 balsa. I have found that straight aluminum bar stock works great to hold the sheeting in place. 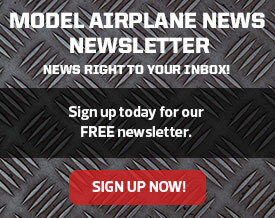 I have a piece of 1/2 x 5/8 that is great for the TE that I got from Aircraft Spruce. 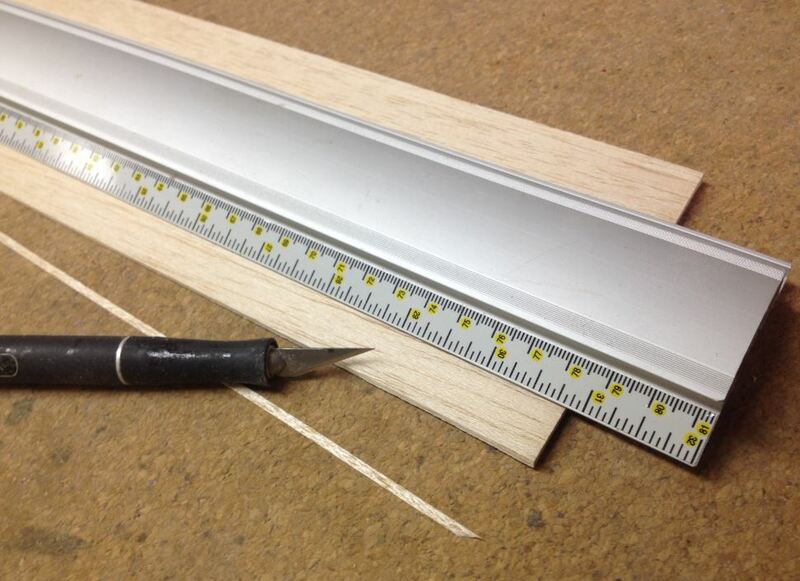 I have some 1.5″x1.5″ 80/20 aluminum extrusions (8020.net) that I use for the rest of the wing sheeting. 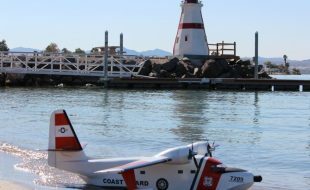 That size is about 1 – 1.3 pounds per foot depending on which type you get and it is straight. The 80/20 is not inexpensive, but it is great for building wings. It comes in other sizes also, the smallest being 1″x1″. You can also add additional weight to the smaller bar stock using the 80/20. BTW, they are shear webs, as they take shear loads in the spar(s); the spar caps take primarily tension and compression loads. You can make some nifty bagged weights that are very inexpensive. Buy some sand box “play” sand from Lowes or Home Depot and double bag using gallon size ( or whatever size you like ) “slider” clear plastic storage bags. Double bagging helps ensure any sand that may leak out will be contained in the outer bag.